Original cover by Rich Buckler; Atlas 1975. Matthew Allison's website is here. 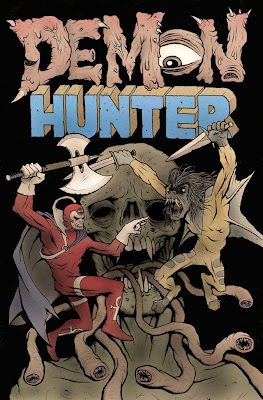 I will be covering various pages from DEMON HUNTER and posting them on my blog as well, with the first page going up the middle of next week. Cheers! In working on this blog, I find myself dreaming of a new horror comic in the spirit of Tales from the Crypt, Creepy, or Taboo with stories by Matthew, Tom Neely, Jimmy Giegerich, Jon Vermilyea, and Michael DeForge. I think it would have to be in color. Black and white wouldn't quite cut it with some of these guys. Matthew, your stuff is so nicely drawn...I'll check out your pages. Someone should start a PANEL BLOG in which artists redraw their favorite panel from some comic. You can bet there'd be plenty of double-page spreads covered. So many of of the first covers I was exposed to were drawn by Buckler. I've got two of his that I want to try to cover all lined up. 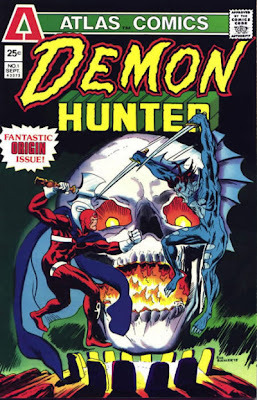 The Demon-Hunter actually migrated to Marvel Comics later on to becone the Devil-Slayer. They colored him slightly differently, though. Wow...Check out Matthew's blog (on his blog) entries for Nov 18th and Sept 12th...fantastic! this is very nice. my favorite part is the title, so awesome! As is always, this cover is amazing Matthew. ps-Robert, I would 100% be down to do something like that! That would be awesome.